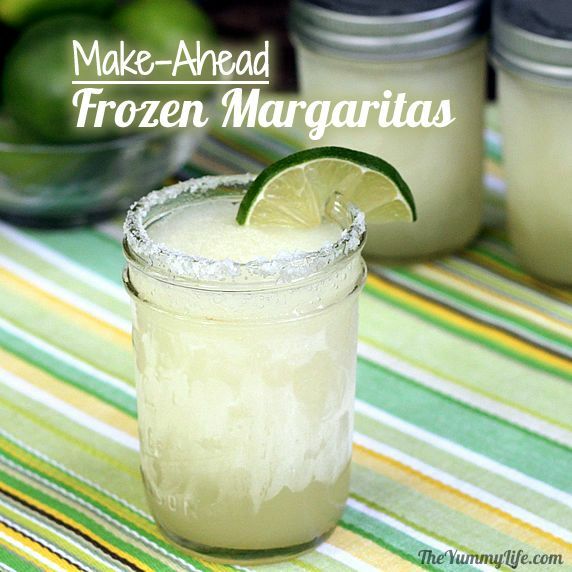 These are perfect for freezing individual servings of these margaritas. This is so easy to use. Insert half a lime and squeeze. That's it! 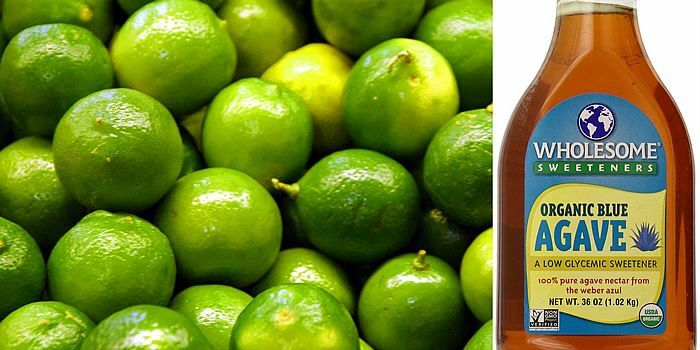 Use it whenever a recipe calls for lime juice... like margaritas and mojitos! This is a great blender. I've had mine for years and it's still going strong. These festive glasses are the traditional way to serve margaritas. This sweetener can be combined with fresh lime juice as a substitute for the frozen limeade concentrate in this recipe. 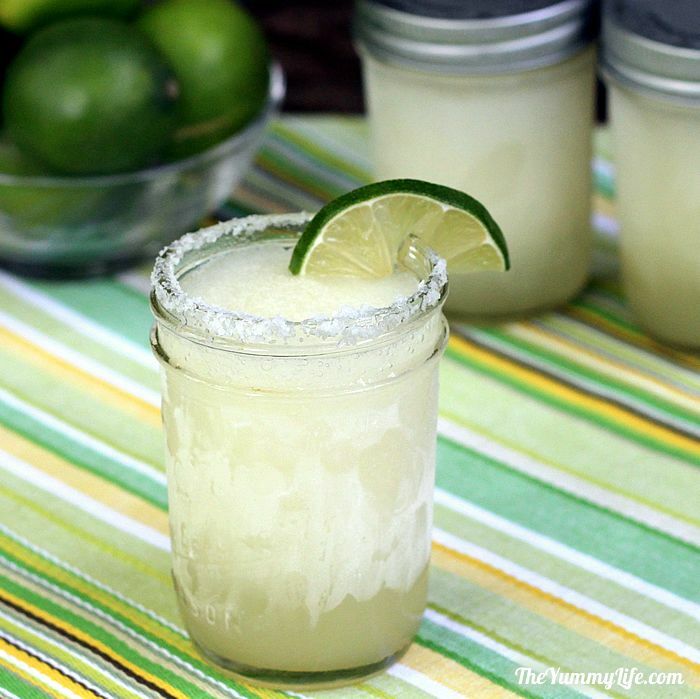 These easy & delicious margaritas can be made ahead, frozen in mason jars, and enjoyed at any time. 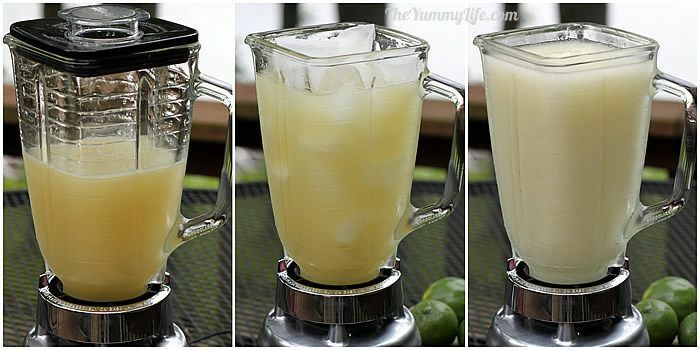 In a blender, combine limeade, tequilla, triple sec, and lime juice. Cover and blend briefly until mixed. Fill blender to top with ice. Cover and blend until slushy and no ice chunks remain. 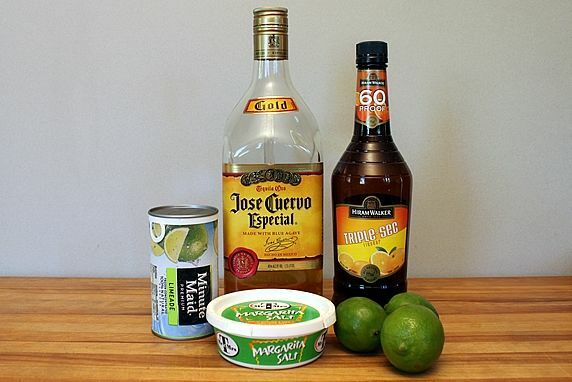 Using a leftover juiced lime, rub the cut side of the lime around the rim of the glasses. Dip glass rims in salt. For an optional garnish, slice a lime into circles or semi-circles, cut a notch in them and hang on the edge of the glass. Pour blended margaritas into 1/2 pint (1 cup) mason jars, screw on the lids and freeze. To serve, remove from freezer & immediately dip it in salt (while the margarita is still solid and won't come out of the inverted jar). 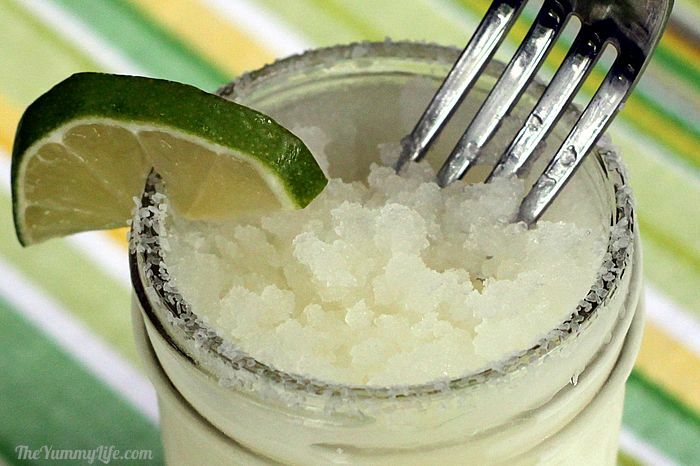 Use a fork to break up and stir the semi-frozen margaritas into a slushy consistency. The alcohol keeps them from freezing to a hard solid state, so they're always ready to remove from the freezer, serve, and drink. VIRGIN MARGARITAS: omit tequila and triple sec and substitute equivalent amount of water. If made ahead, these will reach a hard ice state when refrozen due to the lack of alcohol. Remove them from the freezer and let them sit at room temperature for 10-15 minutes before stirring into a slushy consistency. --1/2 cup agave nectar OR honey OR simple sugar syrup. It's hard to beat a margarita on a hot day. This recipe is a favorite that I've been making for many, many years. Like somewhere around 30 years. King-Man and I often enjoy these margaritas on a hot summer night or when we have friends over. The only problem is that you have to make a whole blender full at one time. When it's just the two of us, as much as I would like to drink a half a blender of margaritas on my own, that's normally not a good idea. (Assuming I want to function in the real world the next day!) After putting some of the leftovers in the freezer to drink at another time, I discovered how well this recipe freezes and refreezes. So, this eventually turned into a make-ahead recipe. I love to serve these when we have parties, but I don't want to be a slave to the blender all night. 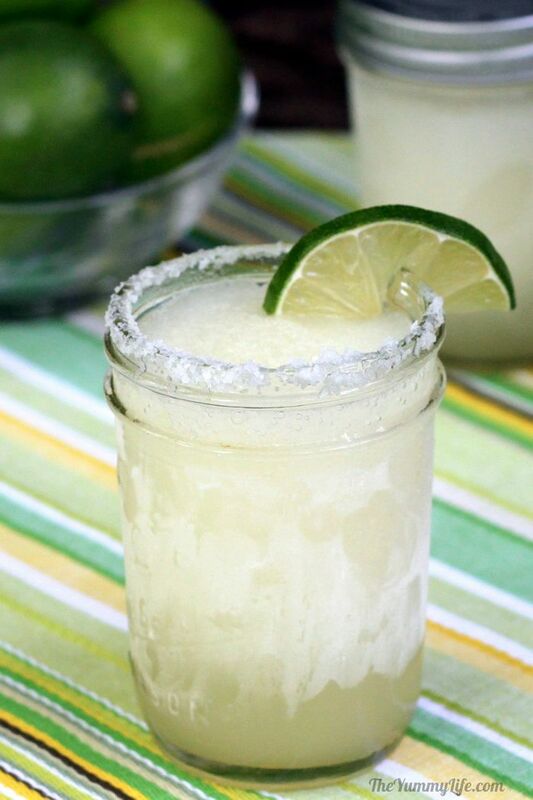 By making these frozen margaritas ahead and pouring them into individual size mason jars before refreezing them, they are ready to serve when the guests arrive. No last minute preparation or blending drinks throughout the party. Love the convenience; and it's a fun, novel way to serve the margaritas that our guests always enjoy. UPDATE WITH NO HIGH FRUCTOSE CORN SYRUP: Since first posting this recipe, I have become concerned about the high fructose corn syrup (HFCS) in the frozen limeade concentrate. In fact, HFCS is listed as its main ingredient. I now make a modified version omitting the frozen limeade concentrate and instead substituting 1 cup of fresh lime juice and 1/2 cup of agave nectar syrup (still a sweetener, but not as bad for you as HFCS). It tastes great and is HFCS free! So, it's up to you if you prefer the convenience of using the frozen concentrate or don't mind a little extra effort to juice a few limes. My printable recipe at the end of the post provides both options. Don't like agave nectar? 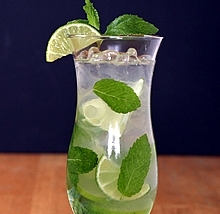 You can also substitute honey or a simple sugar syrup for the HFCS in frozen limeade concentrate. NOTE: I like my margaritas strong and tart. You may want to make some adjustments to the amount of ingredients to suit your taste. Step 3. Fill the blender to the top with ice cubes. Cover and blend until slushy and no ice chunks remain. Some blenders are better than others at crushing ice, so you may need to stop and stir it a few times and keep blending until all the ice chunks are gone. Step 4. 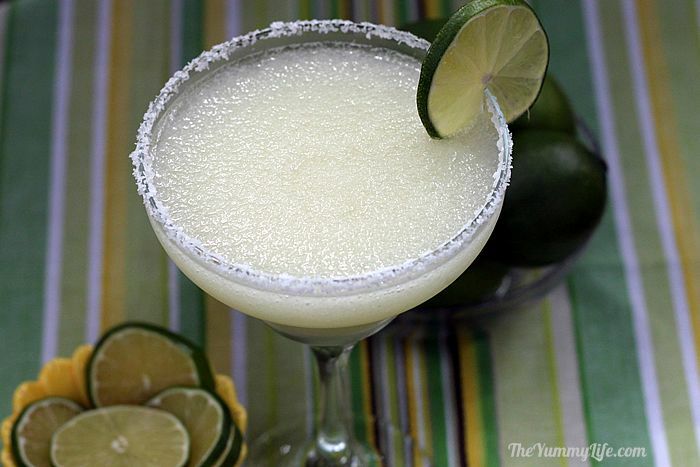 If you're drinking your margaritas right away, run a cut lime around the rim of the glass to make it wet and sticky. Then dip it in the salt. Fill your glass and enjoy! Garnish the glass with a lime slice, if you like. Step 5. 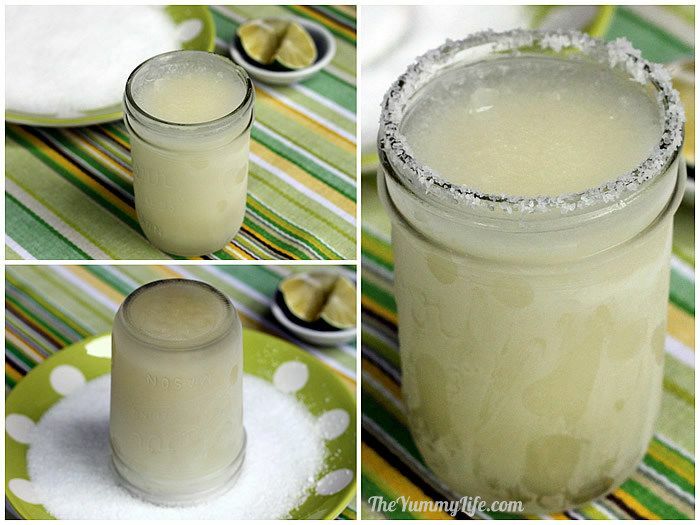 If you're freezing part or all of blended margaritas, pour them into individual jars or glasses. 1/2 pint (1 cup) mason jars work perfectly for an individual serving size; and, they have lids to make it easy to cover them and put them in the freezer. Leave them in the freezer until they're ready to serve. They'll be good for a week or two--assuming they last that long! I can fill 6 or 7 jars from one batch. When you're ready to serve the re-frozen margaritas, dip them in salt immediately after taking them out of the freezer. You need to do this while the margaritas are still frozen solid and won't fall out when you invert the glass. The alcohol in the margaritas keeps them from freezing hard. You can stir them with a fork straight from the freezer, easily breaking the mixture into a slushy consistency. If they're too firm to drink right away, within 5-10 minutes, they'll have the same consistency they had right after they were first blended. Or, you can eat them with a spoon and call it "margarita ice" if you don't want to wait for them to melt a bit. 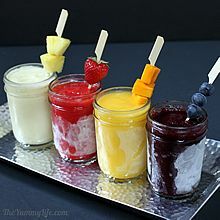 These are an easy, delicious refreshment on a hot summer day. Of course, they're always great with a Mexican meal. Try them with tacos or chips and fire-roasted salsa. GET READY TO PARTY! You might want to make up a blender or two of margaritas, freeze them in individual jars or glasses, and be ready for your next party or picnic. Whether celebrating Cinco de Mayo, the 4th of July, the first day of summer, or any ol' day you choose, these margaritas are hard to beat. VIRGIN MARGARITAS? Easy. Omit the tequila and triple sec and substitute an equivalent amount of water. If made ahead, these will reach a hard ice state when refrozen due to the lack of alcohol. Remove them from the freezer and let them sit at room temperature for 10-15 minutes before stirring into a slushy consistency. This post was updated 5/3/2015.